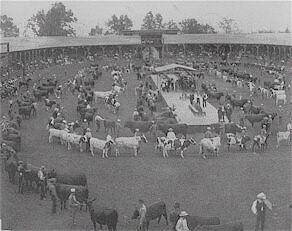 It was said that the show of Ayrshires at the 1904 World’s Fair was representative of the statistical standing and excellence of this dairy cattle breed in the country. All entries in this breed came from east of the Mississippi river with a few from Canada. The judge of the Ayrshire class was Professor Fred S. Cooley of the Massachusetts Agricultural College, Amherst, Mass. Although clearly stated in the rule book, all prizes were to be awarded by using the one-judge system prohibiting the use of score cards. However, Prof. Cooley preferred to use a score card and it seemed to be a success and there were no complaints. Some classes were a challenge for the judge. For example, a dozen bull calves were entered in the show and they had to be brought into the Forum four times before the judge made up his mind. Grand Champion Female: Maud S. 1st of Hillhouse. This page was designed by Lacy Swiney and is maintained by Lyndon Irwin.